There are a few wild animals which tend to live near humans. Coyotes and wolves have been mistaken to be the same animal because of the similarities in their appearances. They have a lot of differences not just appearance wise but also in the ways they hunt, communicate, their diet and the places where they can be located. Both are canines which makes them dog like animals and they can be quite a nuisance to humans if not dealt with the right way. Most often coyotes are called ‘barking dogs’ and belong to the dog species. Unlike a wolf, a coyote has a hairy, thick tail, which it carries lower to the ground. Red wolves are the species which resemble the appearance of coyotes the most. 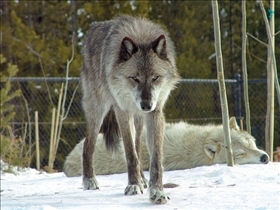 Wolves have grayish, blackish, or white fur and are usually larger in size than coyotes. A wolf can weigh more than twice the weight of an adult coyote. The legs of a coyote are much skinnier than those of a wolf. Coyotes are found commonly from Central America, all over Mexico and U.S., in western Canada up to Alaska. Coyotes are considered to be shy and non-aggressive and their main diet includes smaller animals such as mice and rabbits, vegetation, and carrion. Be careful to keep your household pets in the house at night if you live on the outskirts of civilization in any of these regions. They hunt in pairs and prey on animals like deer. Wolves, on the contrary, prey on larger animals such as goat, sheep and moose and mostly hunt in packs. To determine their territories and track down prey they use the method of scent marking. Animals communicate in their own language, wolves and coyotes however have a unique way of communicating, which has been made famous by Hollywood. The famous howl is one way these creatures communicate, but there is a slight difference between the two when calling out to their fellow mates. Wolves primary way of communication is through howling, they use it to communicate with the other members of the pack and other packs as well. They also howl to attract opposites, when they wake up, and when they sense any sort of danger. However, the howls or barks of coyotes are higher pitched and are long rising and falling notes. Their calls are referred to as yips and yelps. Although coyotes and wolves are mistaken as the same thing, there are several differences between the two creatures which set them apart. 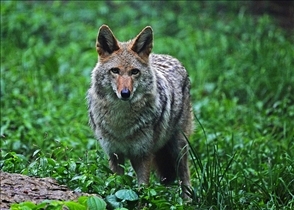 Their appearances can cause human beings to mistake one for the other, coyotes are smaller and much skinner in the legs. A wolf can weight almost as much as twice as a coyote. Coyotes and wolves can be found in different areas. Wolves prey on larger animals and are usually further away from human civilization. Coyotes prey on smaller animals so humans need to protect their household pets at night. Wolves have a distinctive howl they use to communicate with their pack. Wolves live in very organized packs and communicate with each other constantly. Coyotes have a higher pitched and a longer rising and falling notes in their howls, also called yips and yelps. They live in looser packs. Which wild dog howls louder?